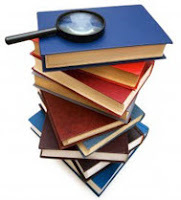 We are continually updating and maintaining models in our Model Library in order to help our customers answer complex questions. You may not be aware but we now have 170 models in our library which are all available for all GoldSim users. 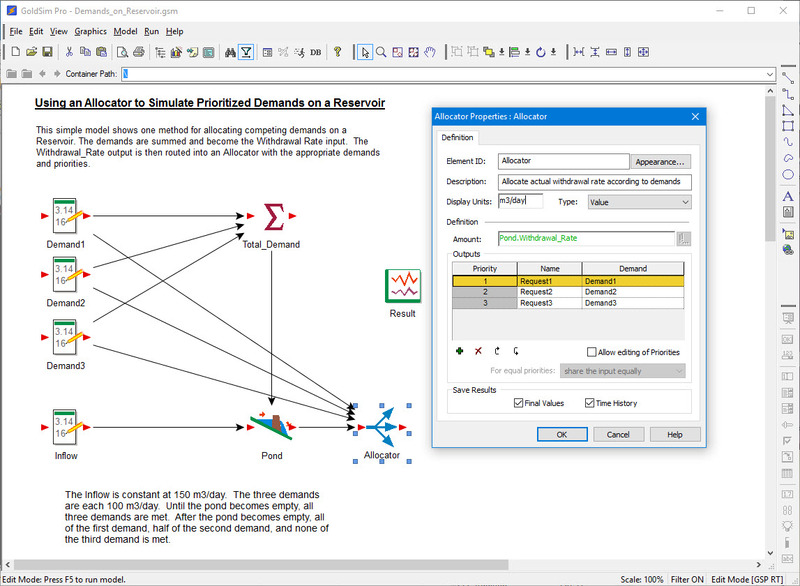 These models are either built for a specific application or just to demonstrate a generic functionality of the software. It turns out that our most widely used model examples are application specific. We track how often each of our models are downloaded and so I thought it might be helpful for you to see which ones are the most popular. Below is a summary of our most popular model library downloads since the inception of our library in early 2013. The models listed below are shown in order of popularity, with our most popular model shown first. The Australian Water Balance Model (AWBM) was developed in the early 1990s by Walter Boughton and is now one of the most widely used rainfall-runoff models in Australia. Many GoldSim models incorporate AWBM for calculating runoff around mine sites and for other projects that simulate rainfall runoff in a watershed. 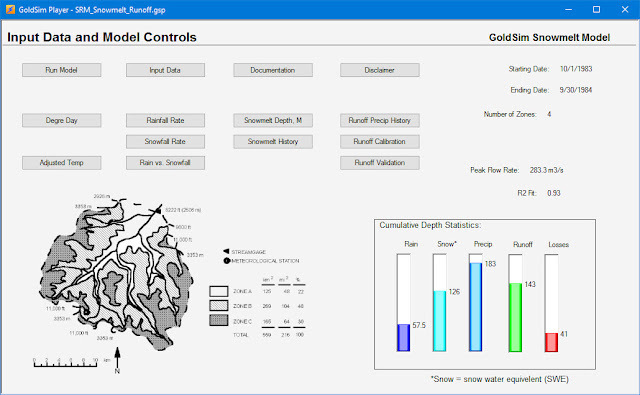 This version of AWBM is intended to be used as a module within other GoldSim models but also works as a standalone model. This model continues to be downloaded about 20 times per month! 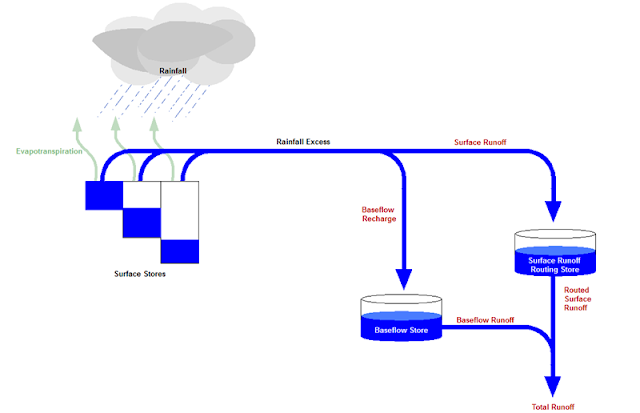 The Muskingum method is a commonly used hydrologic routing method in situations requiring a variable storage-discharge relationship (Chow et al., 1988). This method has been built in a GoldSim model that can easily be copied and pasted into your model as a container. You can either duplicate containers for as many river reaches that you need or you can "vectorize" the calculations so that each item of your vector represents a river reach and therefore only need one instance of the routing functionality. This is a simple, but fairly realistic water balance model for a mine. 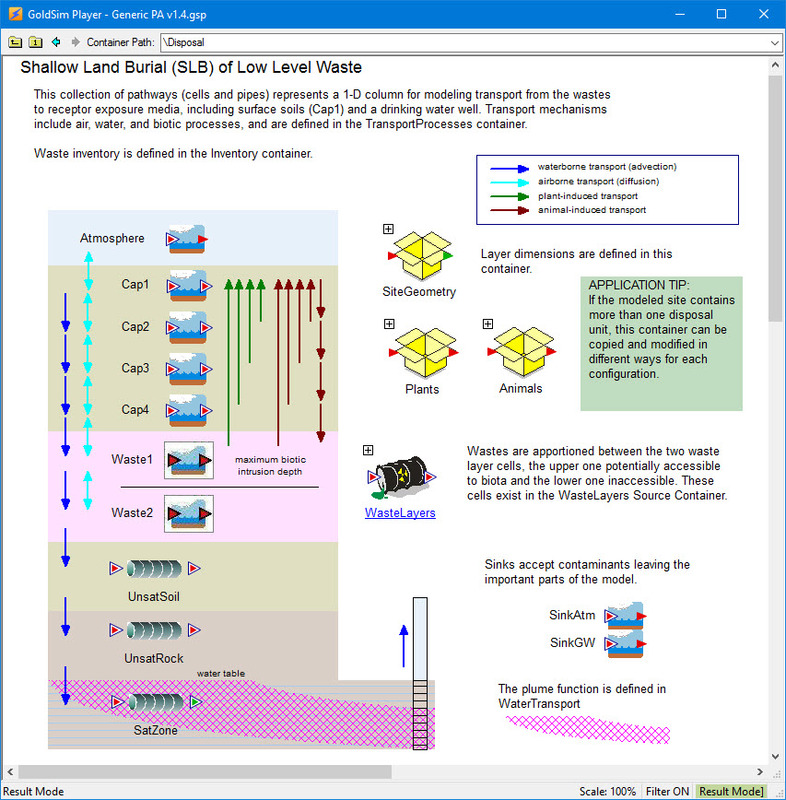 It contains all of the key mine components, including a process water pond and tailings storage facility, and illustrates how such components can be modeled in GoldSim. The purpose of this particular model is to determine how much water this specific mine would need to purchase from an external source. 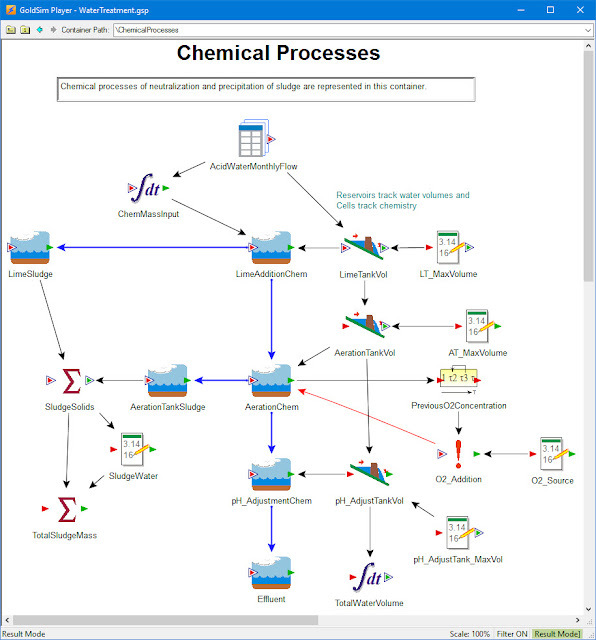 This model provides an example of integrating chemical processes into a GoldSim model where the chemical processes are represented by theoretical equilibrium and empirical relationships developed by methods outside of GoldSim (in this case PHREEQC). 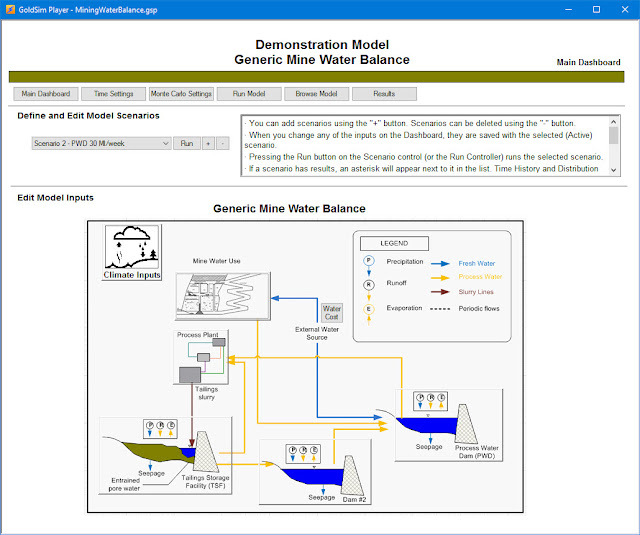 The model simulates some of the major chemical processes that occur in a water treatment plant designed to neutralize and remove metals from an influent water typical of acid mine drainage. These processes require lime and air addition to the water and produce sludge. This simple model shows one method for allocating competing demands on a reservoir. The demands are added together and become the "withdrawal rate" input for the reservoir. 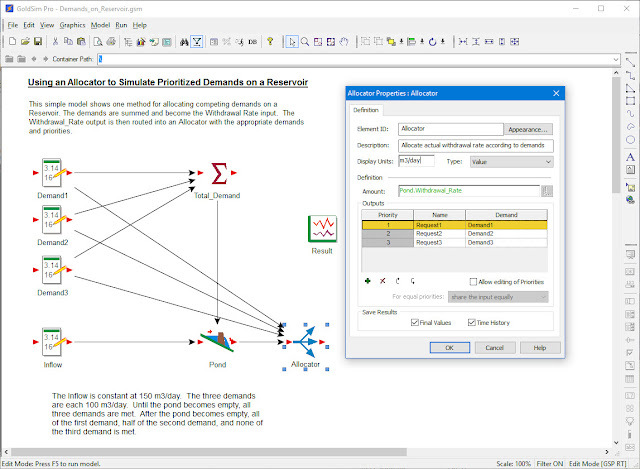 The "withdrawal rate" output is then routed into an allocator element with the appropriate demands and priorities. 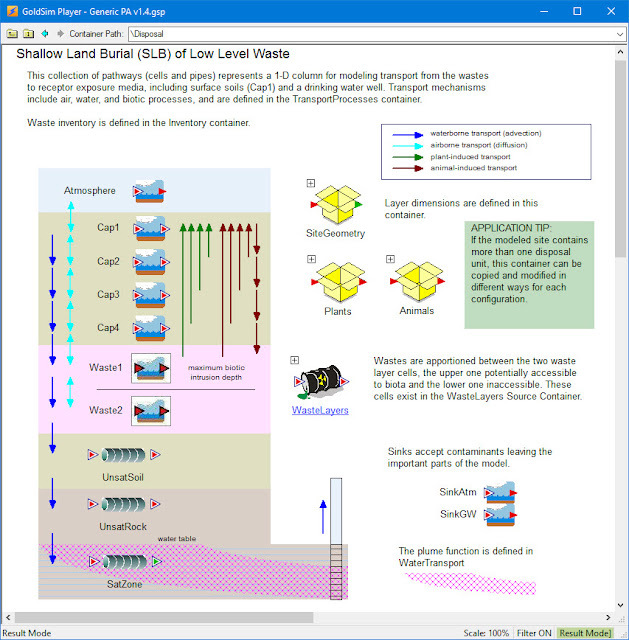 This is a generic (but realistic and fairly complex) model of the performance of a near-surface (shallow land burial) low-level waste disposal facility. 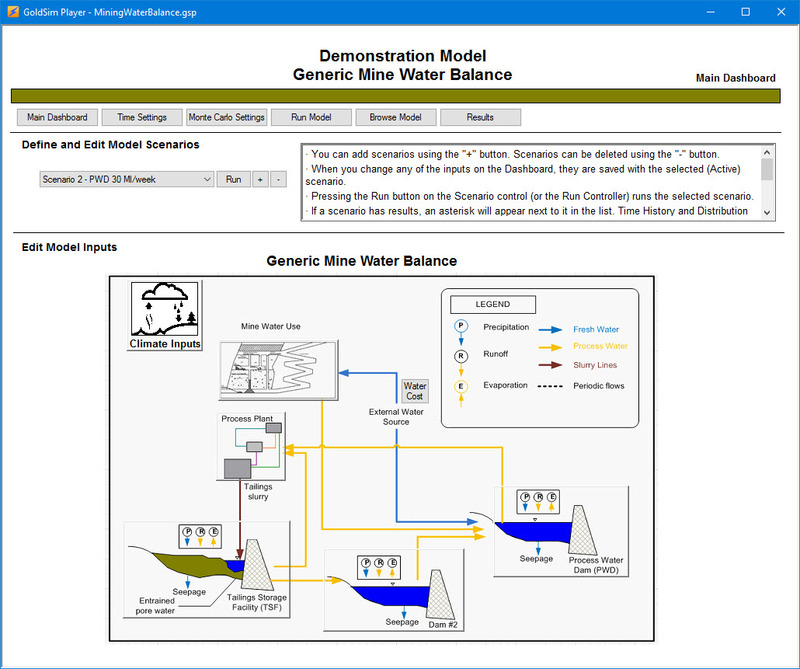 The model includes many typical features and processes that would be part of a real performance assessment for such a facility, but is entirely fictitious (i.e., it does not represent represent any particular site and is meant to be a generic example). 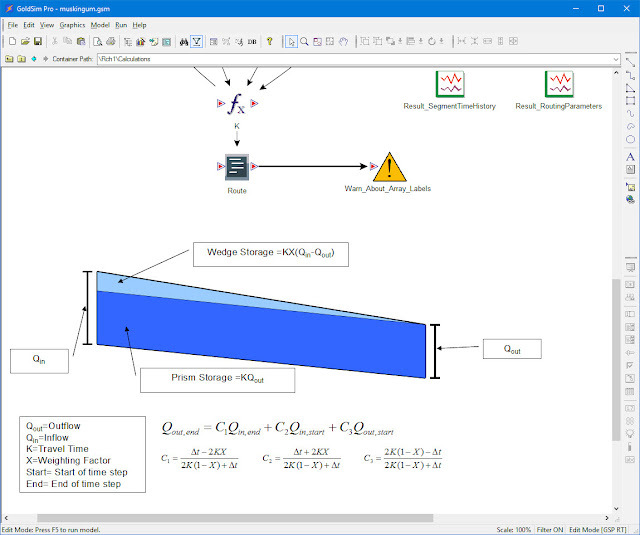 A practitioner could, however, start with this model and by adding site-specific features and parameter values (distributions) use this model as a starting point for a realistic model. This model was created by John Tauxe at Neptune and Company. 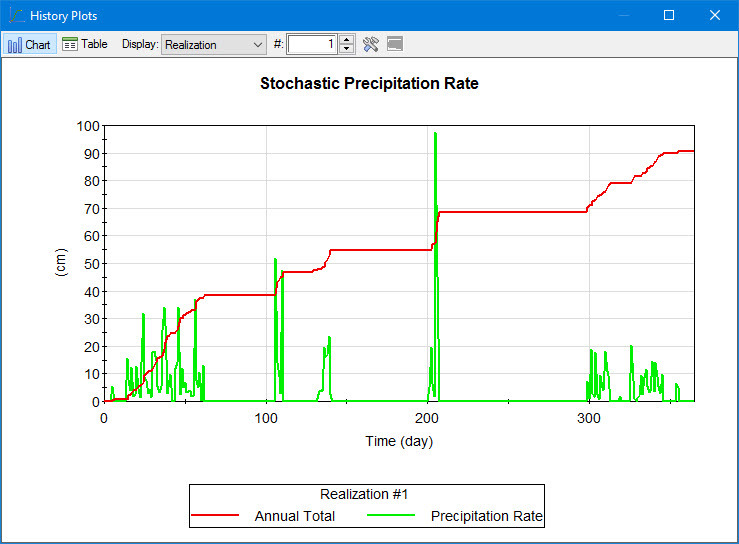 This is the GoldSim implementation of the WinSRM model. It is known to provide support for reservoir operators and water supply managers in anticipating and acting on changes in snowmelt runoff. 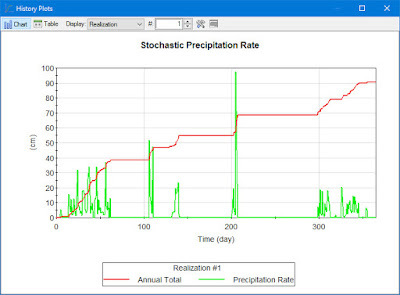 WinSRM can be used for predicting snowmelt runoff which can then be incorporated into a reservoir model to estimate fill targets for the early summer months and often provides decision makers with increased knowledge for their annual strategic planning. 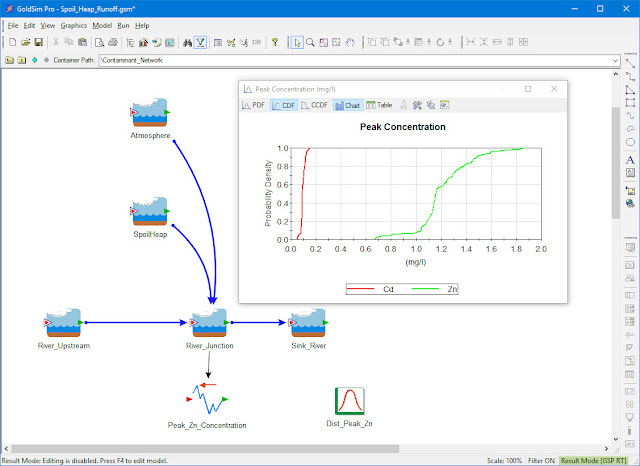 This model simulates the transport of contaminant mass (Zinc, and Cadmium) from spoils pile to a nearby river and simulates the mixing of the contaminated outflows from spoils pile, transported in both the solid and liquid phases, with uncontaminated upstream flow. The Contaminant Transport Module is used to simulate mass transport and a coupled fluid flow network is developed for calculation of inflows and outflows in the transport pathway network. The rainfall runoff process from the spoils pile and surrounding watershed is calculated using very simplistic assumptions that need to be modified for use on a real project. The amount of water, contaminants, and spoil material is calculated as it moves from the spoil heap to a river. The model is run as a Monte Carlo simulation to determine the probability of peak concentration and contaminant loading amounts. These models represent only a small portion of the many we have available in the library. We highly recommend that you take some time to explore it! If you have any questions or comments about any of these models, don't hesitate to contact us. Wow,great information. I am sure the information on your blog will help others,Thanks.